I needed to relieve myself from stress with work and I thought of nothing but mango crepe. Our visit at UCC Coffee in the SM Mall of Asia before watching a movie yesterday totally satisfied my cravings. Weekends are spent usually dining at UCC Coffee MOA. The restaurant had a creative and elaborate Halloween theme with webs and tiny plastic skeletons to delight kids. I felt at home being with tables of families having fun planning about their itinerary for the day. 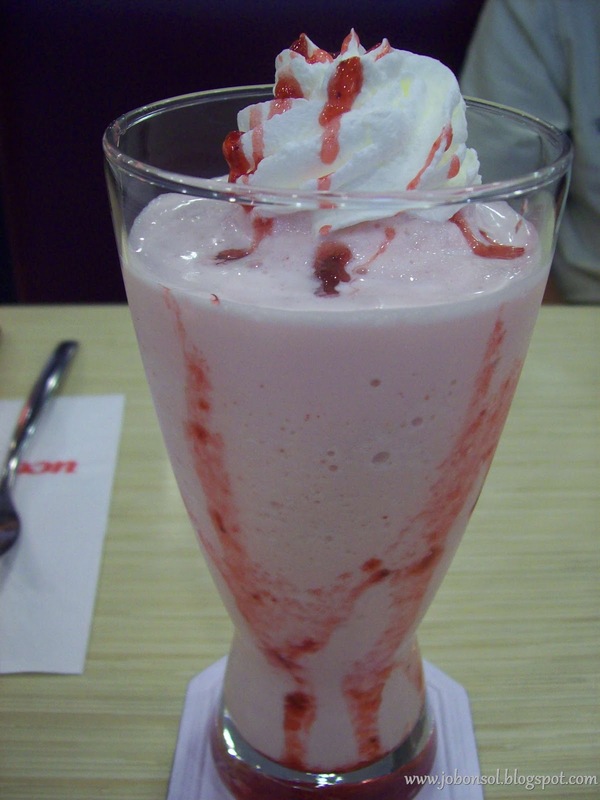 I needed a very cold drink to ease my dry throat after a long travel from home so we ordered Strawberry and Cream Cooler (P155) while browsing the menu. I had always ordered their famous SIPHON-filtered brewed coffee and I always had fun watching how they brew the coffee instant on your table but I just needed a cold drink that day. My son had the same drink and since he didn't know which to order because all the food in the menu looked really delicious, I ordered Mango Crepe (P229) for myself and Yakiniku Rice (P349) for him. As expected, the food was delivered fast and hot on the table with all the courtesy of the staff attending to all my needs. The servings were huge and I was really happy with my choice of Mango Crepe. 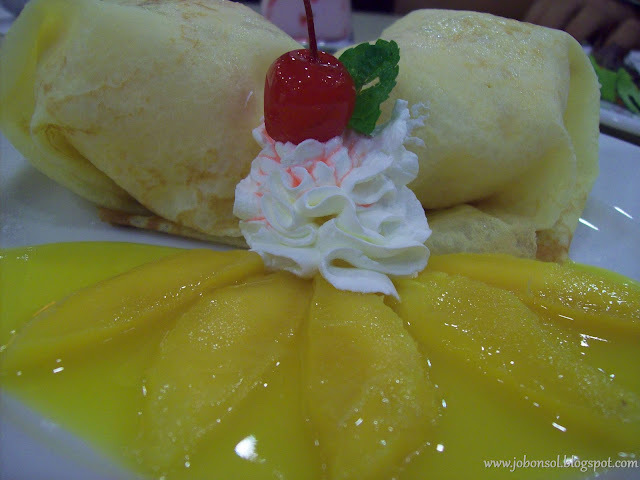 I have ordered the same dessert in many restaurants and some would wrap the crepe with fresh mangoes and cream drizzled with mango syrup on top but their version of Mango Crepe was really different and really delicious. The wrapped crepe was filled with mango ice cream with mango bits and I think the restaurant had made their own or otherwise they had filled their ice cream with fresh mango bits before wrapping them with ice cream. I thought they'd serve just those branded mango ice cream and scoop them in crepes they've made but the texture and the taste of the mango ice cream was different from that I've eaten anywhere. 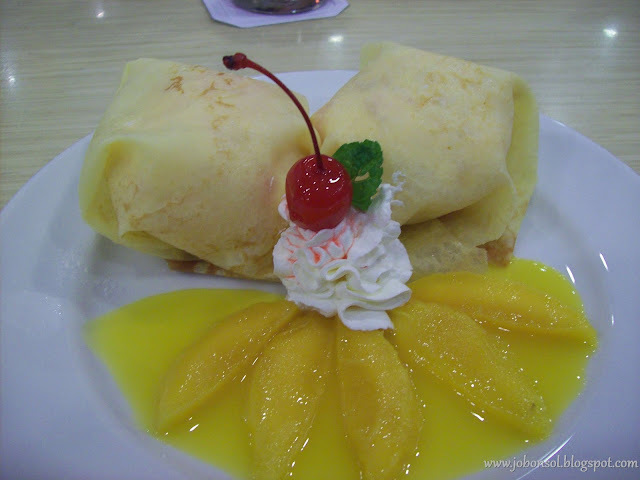 I remember eating mango crepe with my sister and how she loves them with more cream on top. I'm sure she'd bug me to eat this again with her when she reads this. The presentation of the food was neat and the taste was really marvelous. The Yakiniku Rice was also comforting with melt-in-your-mouth beef tenderloin strips in tasty yakiniku sauce on a bed of mayonnaise-drizzled hot rice. My son was so happy he ate the whole thing in less than five minutes. For comfort, food is always a great choice and I was really happy with UCC Coffee's Mango Crepe and Yakiniku Rice. I think I'd order next time their delectable Seafood Salad and more of their delicious pasta dishes. 1. UCC Coffee or more popularly known in Kobe Japan as Ueshima Coffee Company Ltd., started as a store under the name of "Ueshima Tadao Shoten" in 1933. It became limited partnership in 1940 and on 1951, became "Ueshima Coffee Co., Ltd.".Now UCC Coffee, Sakae Sushi, Cafe City 1888, Caveman and Yeti and Crepes and Cream chains are operated by the famous restaurateur Mr. Hubert Young. 2. 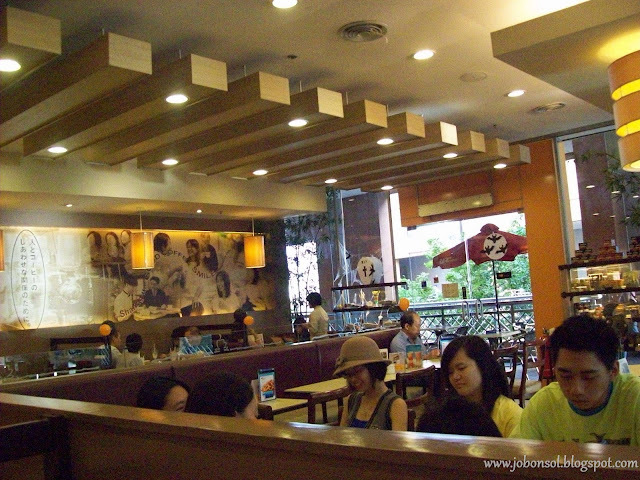 UCC Coffee serves Filipino food like Adobo Flakes Spaghetti and Spicy Bangus Pasta and other unique Japanese-Filipino fusion dishes. 2.Review: How will you eat Greenwich's Top That Pizzas? 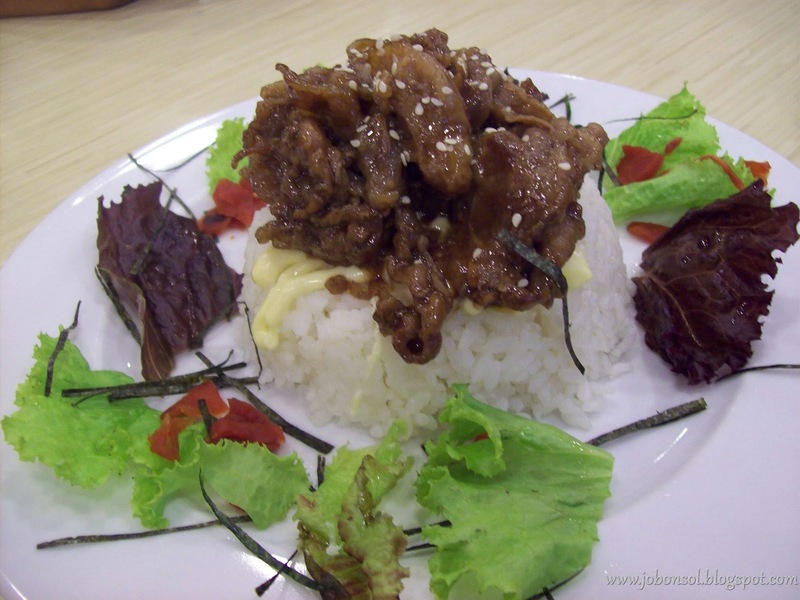 3.Review: Kogi Bulgogi introduces Korean style of eating Ssamgyeopsal to Filipinos! 4.Event: Mango Tree Bistro opens in Trinoma! 6.Event: Red Kimono celebrates 5th year with My Maki Masterpiece Challenge! 7.Review: Awaken the child in you with Caveman and Yeti shaved ice!